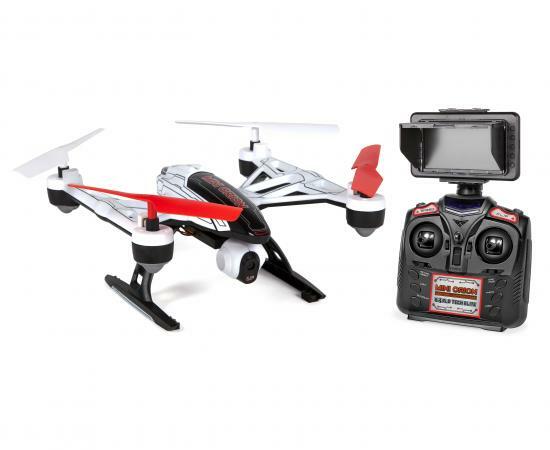 The World Tech Elite Mini Orion 2.4GHz 4.5CH LCD Live-View Camera RC Drone packs a big punch into a small package. It's the perfect starter drone for beginners, and fun to play with even for the more seasoned drone enthusiasts. Unlike many people, we read the entire manual before getting started with the Mini Orion. The manual itself is clearly written, easy to follow, and covers all of the bases needed to start using the drone. We were soon unboxing and charging. The drone itself comes with everything you need to fly, including batteries. This is a definite plus, especially when you are giving this as a gift. One of the really cool features is a built-in view screen that you can attach to the remote and see what the drone's camera is picking up while you are flying it. It's simple to add and a real bonus when flying. The manual says that the battery takes about 60 minutes to charge, but we tried it a few times and it was fully charged after ten minutes, even when we ran it down completely and recharged. This drone is simple and fun to fly - and it takes a beating! It was flown (accidentally of course) into power lines, crashed to the ground, and flown into other obstacles. Each time it just kept on going. The range is great as well - it goes high and is still easy to control as long as it's not too windy. The battery life is about five to six minutes, which is clearly stated in the manual, but the time went by far too quickly as we were having a lot of fun with it. A spare battery or two is recommended if you plan to use the drone for longer than a few minutes at a time. We received the World Tech Elite Mini Orion 2.4GHz 4.5CH LCD Live-View Camera RC Drone at no cost courtesy of HobbyTron.com.